It was a hot acerbic afternoon. We had arrived earlier, tired, dirty and stinking, from Ratnagiri. Sujay had left for Mumbai, so it was only the three of us. Mama's country house is at the outskirts of the small town of Devrukh. The colony consisted of mostly retreats and country houses. It was all mostly empty and silent. The oppressive heat of the May afternoon quietened all life. There was water shortage of acute proportions, so we had to abandon all plans of watery pleasure. We became spiritual instead. Raju started playing the guitar. Mama drifted into the sleepy surreal. 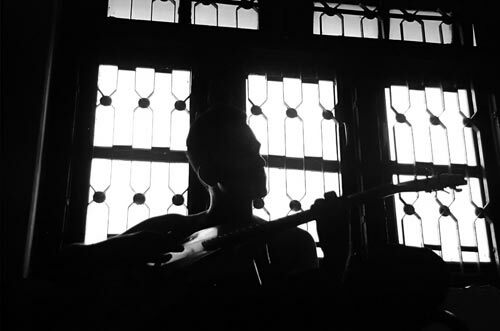 I listened to the guitar and the silence and contemplated. There was no large tree, so a chair sufficed. Sometime in between I clicked a photo of the mood.